Hello my friends! I hope your week is going great! I am happy to be guesting again with Waffle Flower Crafts! 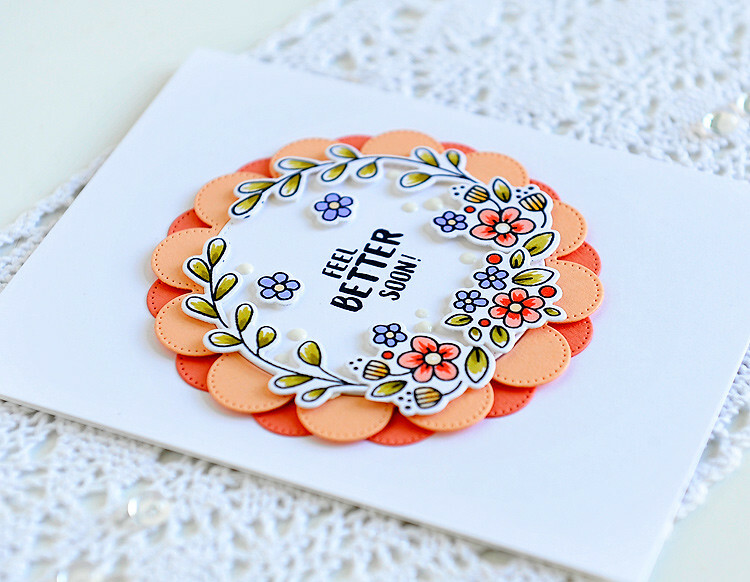 I have a card and post up over on the Waffle Flower Blog! You can see the whole card and read all the details HERE. They are also giving away a $10 gift certificate! Simply beautiful! LOVE the colors you picked Kay! Looks beautiful. I also love the crocheted doily(?) under the card. :) Off to see more! Really cheerful. Who wouldn't feel better. Thanks for sharing, I do love the Waffle Flower company. so pretty Kay! The links in your post don't take us to your card though. When I click on home it takes you to their store. I can't figure out how to get to the home page of their blog...tried 'news', that didn't work. I was also unable to get the the blog post showcasing your card. But I'm anxious to see it. I checked back this morning but so far it isn't there. Hi Stephanie! Thanks as always for your sweet comment! I hope all is well with you! I hope you got to see my card. I must have put mine up a little early :) Glad you are getting some good tips from the videos! It's fun to try new things! Happy week! This is darling Kay! Love the sweet little blooms and the pretty colors you used! So bright and cheerful, love it!